It's that wonderful time of year again...May in Michigan football blogger-land. It's that time of the year when there is absolutely nothing interesting to write about. So serious bloggers, such as myself, are forced to be creative and come up with content to fill these endless virtual pages. So that bring us to our 4th annual B1G Coaches Hot Seat [2008: Part 1, Part 2. 2009: Part 1, Part 2. 2010 Part 1, Part 2]. It's a fair, unbiased and hard look at the overall status of each B1G coach, how they are doing, and how much longer we think they'll be doing it. We're certainly not the only blog out there that does this, but we like to think we're the one that does it best. So let's get it on! Today we'll look at the Legends Division, which welcomes 2 new coaches to the league, as well as Nebraska's Bo Pelini. The classic Ferentz stare. Hands on hips, eyes on the prize. 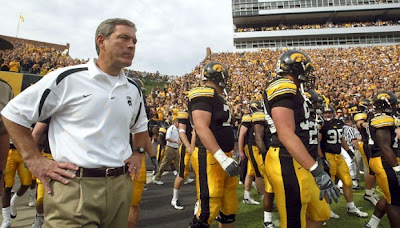 Ferentz took a bit of a hit in Iowa City last year with a 8-5 season and tying for 4th in the league at 4-4. He also took a another hit in the off-season when 13 of his players had to be hospitalized due to intense off-season workouts. And ugly situation for Iowa, and one that is still being worked out. Last year we had him totally safe. But with losses at Arizona, Wisconsin and tOSU at home, and two ugly losses on the road at Northwestern and Minnesota, the heat has been instantly turned up to the point where it was prior to 2008. Hard to really say that Kirk is really in need of a good or great season. He's proven throughout his career that he can win at Iowa. But he's losing a considerable amount of talent on both sides of the ball going into this season. He needs to replace his QB Ricky Stanzi (! ), a couple guards, WR Colin Sanderman and his starting FB and TE. On the other side of the ball, the defensive line will need to replace Adrian Clayborn (! ), Christian Ballard and Karl Klug. LB Jeremiha Hunter and DB Tyler Sash are also gone. Fortunately, Iowa's schedule is kind to them to start the season. But a repeat of 2010 is likely with so much rebuilding taking place. 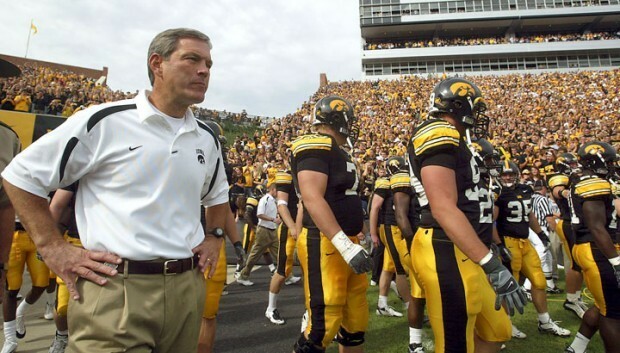 No question Kirk Ferentz is an institution at Iowa. He's one of the most successful and most respected coaches in the league. He's the highest paid coach in the B1G at $3.3 million dollars a year, and his current contract which was extended in 2009, will end in 2016. Brady likes to point at things. We now know for sure how high the bar is set for Michigan coaches. Beat tOSU. Beat Sparty. That is the rallying cry in Ann Arbor. 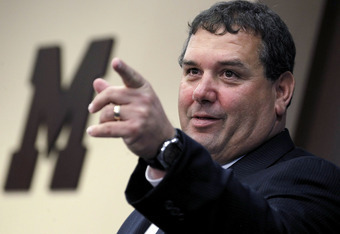 Brady Hoke gets it. He gets it so well, there are two countdown clocks in the Michigan weight room, one counting down to kickoff against Michigan State, and the other counting down to kickoff against tOSU. For all of the things that RichRod was good at, he was really bad at two things...playing defense, and beating (or even being competitive against) tOSU. Even a New Year's Day bowl was not enough to salvage the Rodriguez era. Not when you lose that bowl game 52-14. Hoke represents a cleansing of the RichRod era at Michigan. He has that "Michigan Man" pedigree that seemed so important to so many people, including AD Dave Brandon. So far the proverbial air around the program just seems so much cleaner. Players seem happier, the defense is already looking much more improved, Denard is still here. And most importantly, Hoke has made a great impression so far with recruiting. The program is communicating more openly with area HS coaches, and the hiring of Raven's DC and former Michigan DC Greg Mattison is already paying dividends. No question it is way to early to tell how good or bad Michigan will be on the field this year. I do however expect a much improved defense and just a better overall team. Hoke welcomes back 10 starters on offense and 9 on defense. They don't have a road game until the 2nd week of October, and only head out on the road 4 times. Once that foot meets a football on September 3rd, the honeymoon will be over, and it will be time for Hoke and company to show us what they got. Michigan fans will have no problem forgetting the RichRod era, but that's only if Hoke can help us forget. Right now it's simply just a waiting game. Hoke's contract pays him $2 million dollars a year, which will increase $100 thousand each year, and goes until 2017, with a "stay bonus" of $1.5 million in 2013. This is Dantonio when he's happy. Mark Dantonio finally gave Sparty fan the kind of year they had been waiting for. 11 wins and a tie for the B1G championship. A dramatic win in OT against the Irish, a win in Ann Arbor, giving Wisconsin their only loss of the year, and another nice win in Happy Valley. Only a bad road loss to Iowa was the only thing that stood in the way of a perfect season. They were snubbed by the BCS and sent to the Capital One Bowl, where they dismantled by the Crimson Tide 49-7. That and a schedule that did not let them play tOSU were the only set backs in 2010. But the core of the Sparty offense remain intact for 2011 with 7 starters back, with the exception of 2 tackles, a TE and their center. The defense will have to replace 4 of it's top 5 tacklers. Losing Greg Jones, Eric Gordon, Marcus Hyde and Chris Rucker will hurt this team. I just don't know how deep the talent pool goes. The 2011 schedule is going to be a bit tougher as well. Sparty plays in a 4 week stretch...@ tOSU, Michigan, Wisconsin, and @ Nebraska. By then end of October, MSU could be sitting at 2-6 if they're not careful, but I don't see that happening. Don't forget, Sparty is the ONLY B1G team that gets to play the watered-down version of tOSU, which will be without Sir Teflon and his band of 5 merry men. If Sparty is able to repeat the success of 2010, they're going to need to get some lucky breaks along the way...getting a tOSU when they do is a nice bonus. But Dantonio will have to earn his $1.9 million dollars the hard way if he plans on keeping Sparty fan happy. His current contract ends in 2016. He kinda looks like a gopher. Just sayin'. 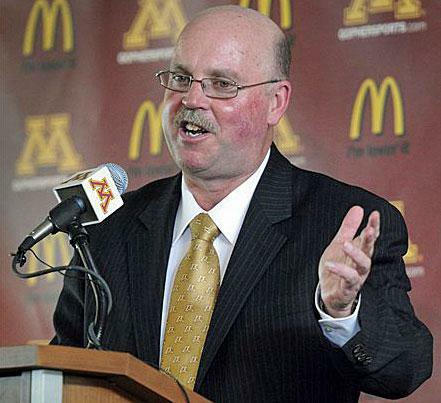 Jerry Kill brings wealth of experience with him to Minnesota. After coaching at Saginaw Valley State, Emporia State, Southern Illinois and Northern Illinois, he's already put together a 17-year head coaching career. Not exactly a spring chicken. Minnesota welcomes their new head coach in with a road test at USC in week 1. Welcome to the next level of head coaching Jerry. But a change was needed at Minnesota. Tim Brewster was clearly not the answer. And although we only thought he needed a good year last year in order to stick around, the Gopher brass clearly thought 1-6 was enough. And Brewster was fired on 10/17 after losing to Purdue 28-17. To be completely honest with you, I don't really know much about Minnesota. We didn't play them last year, but I can only imagine things will improve for 2011. The Gophers have 6 offensive starters returning, but will need to replace QB Adam Weber, the entire right side of the o-line and their FB. Defensively however, things look better with 8 starts back. Only the nose tackle Jewhan Edwards and safeties Ryan Collado and Kyle Theret will need to be replaced. Kill's contract pays him a base salary of $500 thousand a year for 5 years. 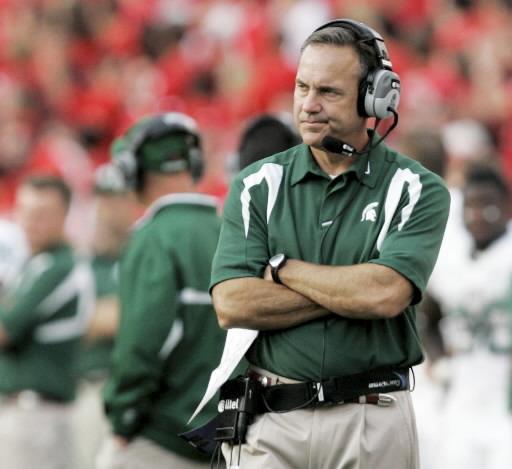 Dantonio is the B1G's resident curmudgeon. Suddenly, a contender emerges. First of all, Pelini is a product of tOSU...so there's strike one. A lot people expect Nebraska to do very well in the B1G. And I am no different. But...I do not expect them to take over, of course...the B1G is far superior to the Big 12 north in terms of opposing talent. Nebraska will find out, just as Penn State did in the early-mid 90's that a B1G schedule is grueling. The B1G conference has decided to welcome Nebraska to the table with probably the leagues toughest slate. Road games at Wisconsin, Penn State and Michigan...and home games against tOSU, Sparty, Northwestern and Iowa. Thank goodness for the cake-walk non-conference schedule because October and November are going to be challenges. Pelini brings a very good Cornhusker team to the league...a team that made it all the way to the Big 12 title game against Oklahoma, but lost 23-20. But they lose a few o-linemen, and 3 defensive backs, so there is some work to do there. As far as I can tell, Pelini seems like a good fit at Nebraska. He was a long-shot to replace RichRod at Michigan back in early January, but I think a lot of that was just speculation by some crazy internet people. 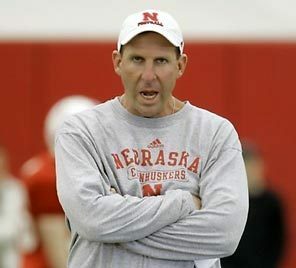 Pelini hauls in $1.851 million dollars a year and his contract goes until 2014. Once a linebacker, always a linebacker. I don't really know how to classify Fitzgerald right now. On one hand he's the most perfect-est coach Northwestern could ever have hoped for. He's the prodigal son. He played there during the mid-90's, led Northwestern to maybe one of the most glorious two-year stretches in school history. Became the youngest coach in Div. 1 history. Was selected to the college football hall of fame. 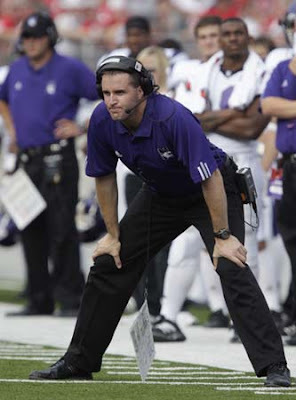 If you're a NU fan, you probably love Pat Fitzgerald...and are willing to give him as much time as possible to bake up a championship contender. And I have no doubt that, if given the time, Fitz can certainly do just that. The question is, how much patience do all twenty-seven Wildcat fans have? Things have been slowly getting worse in Evanston over the last couple years since the big 9-win season in 2008. But on the bright side, NU welcomes back 9 offensive starters and 7 defensive starters. Couple that with a typical NU non-conference schedule, and they could very well be sitting at 4-0 when Michigan comes calling on Oct 8th. But they split 6 games at home, 6 games on the road...which could wear on a team. If I could find a NU fan, I would love to ask them what their honest expectations are for 2011. Last year they started off 5-0 before dropping 6 of their last 8 against a typical B1G schedule. Fitzgerald hauls in $800 thousand dollars a year, and goes until after the 2015 season.